Preheat the oven to 220 ºC (or 425 F) Cut the potatoes in thin slices (not peeled but rubbed clean). Chop the eggplant into 1 cm cubes and slice the zucchini. 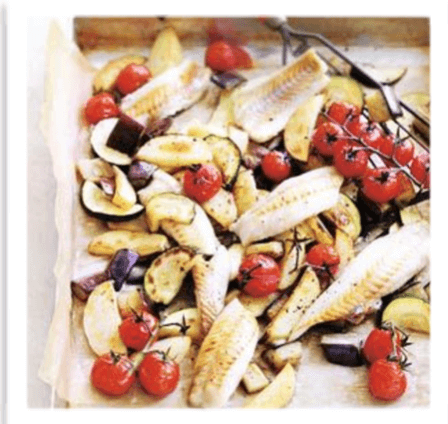 Spread the potato and vegetableslices onto a baking sheet and drizzle with olive oil, salt and pepper. Bake in the oven for about 35 minutes. Cut the cod into 6 pieces and season with salt and pepper. Heat the cod betweenthe vegetables for another 10 minutes (or till cooked). When you serve this dish, you can garnish with anchovies to add an extra salty flavor.